The screen on a mobile device is critical to the user experience. The improved Adaptive Brightness feature in Android P automatically manages the display to match your preferences for brightness level so you get the best experience, whatever the current lighting environment. (Settings → Display → Brightness Level). In Android Pie, Adaptive Brightness is enabled by default (Settings → Display → Adaptive Brightness). * Setting the slider to center resulted in the device using the preset. * Setting the slider to the left of center applied a negative scale factor, making the screen dimmer than the preset. * Setting the slider to the right of center applied a positive scale factor, making the screen brighter than the preset. So, under low ambient light conditions, you might prefer a brighter screen than the preset level and move the brightness slider up accordingly. But, because that adjustment would boost the brightness at all ambient light levels, you might find yourself needing to move the brightness slider back down in brighter ambient light. And so on, back and forth. The slider control now represents absolute screen brightness rather than the global adjustment factor. That means that you may see it move on its own while Adaptive Brightness is on. This is expected behavior! Humans perceive brightness on a logarithmic rather than linear scale1. That means changes in screen brightness are much more noticeable when the screen is dark versus bright. To match this difference in perception, we updated the brightness slider UI in the notification shade and System Settings app to work on a more human-like scale. 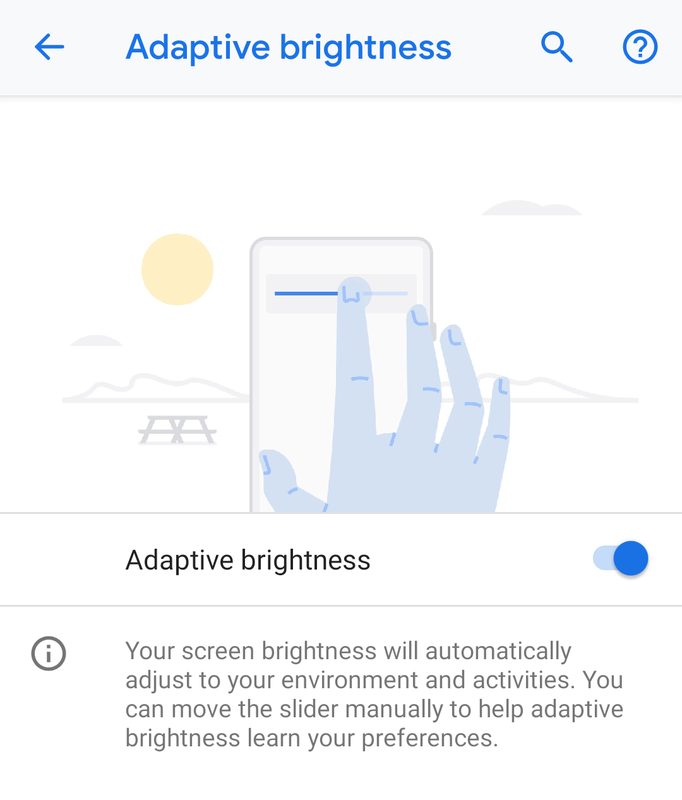 This means you may need to move the slider farther to the right than you did on previous versions of Android for the same absolute screen brightness, and that when setting a dark screen brightness you have more precise control over exactly which brightness to set. Prior to Android P, when developing a new Android device the device manufacturer would determine a baseline mapping from ambient brightness to screen brightness based on the display manufacturer's recommendation and a bit of experimentation. All users of that device would receive the same baseline mapping and, while using the device, move the brightness slider around to set their global adjustment factor. To determine the final screen brightness, the system would first look at the room brightness and the baseline mapping to find the default screen brightness for that situation, and then apply the global adjustment factor. What we found is that in many cases this global adjustment factor didn't adequately capture personal preferences - that is, users tended to change the slider often for new lighting environments. For Android Pie we worked with researchers from DeepMind to build a machine learning model that will observe the interactions that a user makes with the screen brightness slider, and train on-device to personalise the mapping of ambient light level to screen brightness. This means that Android will learn what screen brightness is comfortable for a user in a given lighting environment. The user teaches it by manually adjusting the slider, and, as the software trains over time, the user should need to make fewer manual adjustments. In testing the feature, we've observed that after a week almost half our test users are making fewer manual adjustments while the total number of slider interactions across all internal test users was reduced by over 10%. The model that we've developed is updatable and will be tuned based on real world usage now that Android Pie has been released. This means that the model will continue to get better over time. We believe that screen brightness is one of those things that should just work, and these changes in Android Pie are a step towards realizing that. For the best performance no matter where you are models run directly on the device rather than the cloud, and train overnight while the device charges. The improved Adaptive Brightness feature is now available on Pixel devices and we are working with our OEM partners now to incorporate Adaptive Brightness into Android Pie builds for their devices. Android Wear 2.0 represents the the latest evolution of the Android Wear platform. It introduced the concept of standalone apps that can connect to the network directly and work independently of a smartphone. This is critical to providing apps not only to our Android users, but also iOS users - which is increasingly important as we continue to expand our diverse ecosystem of watches and users. In addition, Wear 2.0 brought multi-APK support to Wear apps, which reduces the APK size of your phone apps, and makes it possible for iOS users to experience your Wear apps. Today, we are announcing that multi-APKs will also work for Android Wear 1.0 watches, so you can now reach all of your users without needing to bundle your Wear app within your phone app's APK. Additionally, the Google Play Store policy will change to promote the use of multi-APKs and standalone apps. This covers all types of apps that are designed to run on the watch, including watch faces, complication data providers as well as launchable apps. Mobile apps that support Wear notification enhancements but do not have a separate Wear app. Wear apps that are bundled with mobile apps instead of using multi-APK. Since multi-APK is now supported by devices running Wear 1.0 and 2.0, developers embedding their Wear app APKs in phone APKs should unbundle their Wear APK and upload it to the Play Store as a multi-APK. 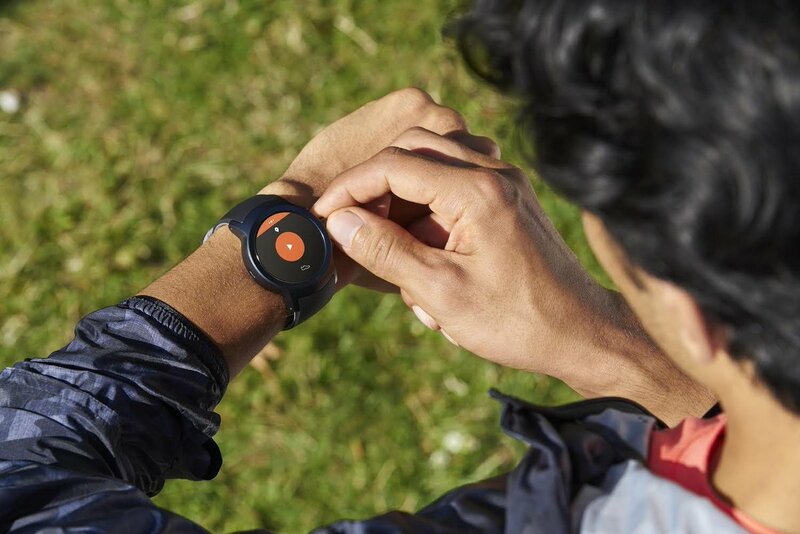 This will allow them to continue to qualify for the "Enhanced for Android Wear" badge as well as be eligible to appear in the Android Wear top charts. The two APKs can continue to share the same package name. In addition to providing top app charts, we periodically put together curated featured collections. To be eligible for selection for these collections, developers will need to make their Wear apps function independently from the phone, as a standalone app. These apps will need to work on watches that are paired with both iOS and Android phones. Standalone apps are Wear apps that do not require a phone app to run. The app either does not require network access or can access the network directly without the phone app - something that is supported by Android Wear 2.0. In some rare cases, the user experience may be enhanced by the syncing of data between the phone and watch. For example, a cycling app can use the watch to display the current pace, and measure the user's heart rate, while displaying a map on the phone. In this scenario, we recommend that developers ensure that their Wear apps function without a phone and treat the phone experience as optional as far as the Wear apps are concerned. In these cases, a Wear app is still considered standalone and should be marked as such in its AndroidManifest.xml file. From the beginning, Android Wear has been about wear what you want -- the styles, watches, and apps you want to wear. This latest policy change lets you highlight your Android Wear apps, giving users even more choice about what apps they want on their watches. To further support all you game developers, we've updated our popular developer tools to give you a consistent set of game services across platforms for a better, more stable experience, with a particular focus on improvements to the Play game services Unity plugin. In addition, we added support for the Nearby Connections API, launched earlier this year at GDC, to our C++ SDK and Unity plugin. Let’s take a look a closer look! We’ve added full support for Events and Quests in the Unity plugin. If you’re a Unity developer, you can now incorporate Quests into your games and take full advantage of Player Analytics natively within the Unity IDE. We’ve also listened to feedback from our community of Unity plugin users and made stability improvements to Play game services Multiplayer, Saved Games, and to sign-in. You’ll now have a much better experience integrating with these Play game services, with fewer crashes and glitches. We have added support for the Nearby Connections API to our C++ SDK and Unity plugin. You can now easily build awesome second screen and local multiplayer experiences, like this Beach Bugging Racing example, with the development tools you are most comfortable with. We’ve also made major improvements to our Play game services CocoaPods, which simplify dependency management and building App Store packages from Xcode. The CocoaPods will improve building for iOS with the Play game services iOS and C++ SDKs, and the Unity plugin. We also improved the stability of multiplayer on iOS, eliminating many of the issues around accepting match invitations. Finally, we improved our support for iOS 8, making it easier to set up multiplayer push notifications, and fixing UI compatibility issues.